I'm pleased with the progress my little corner shade garden is making this season. I added the ferns and hostas this year. The spot was home to a lovely pink old fashioned fuchsia that sadly, does not appear to have survived the harsh cold snap we had last December. Tis a bummer, but I am already thinking about putting an old fashioned bleeding heart fuchsia there instead. I think it would be a nice touch. What a sweet shade garden. I love your roses in your sidebar. Looks to me like a nice little bouquet! It looks perfect! 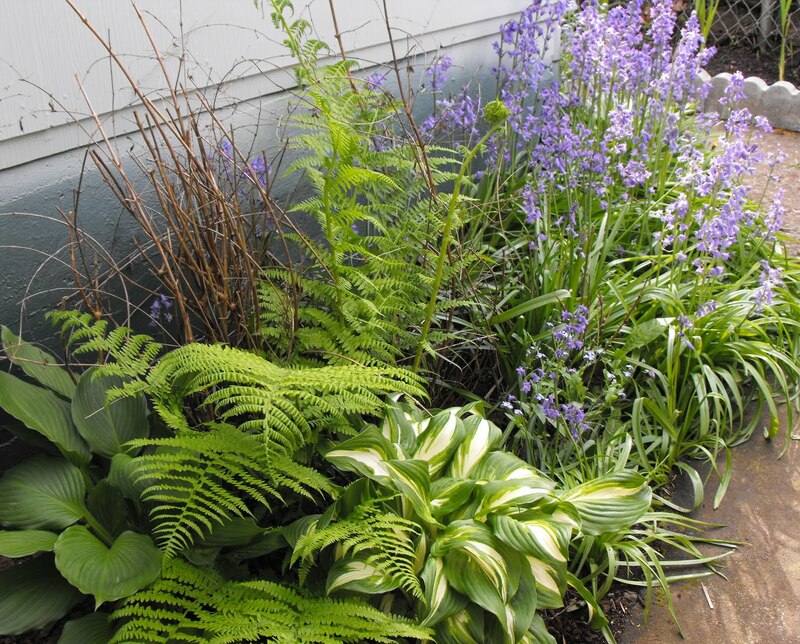 I love the fern with the hostas. Hope you're having the same nice weather we've been having. Hey Jenni, thanks for stopping by. We're practically neighbors! You're the 2nd person that seems to be close by that commented after I did the Nutty Narrows post. It's located across from the library. I just got done snooping all over your blog at your lovely flowers. Jenni your shady bed is so pretty. A Bleeding Heart would be just the thing.